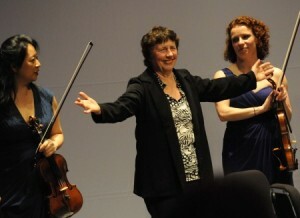 At Carmel’s Sunset Center last night, Chamber Music Monterey Bay and the Daedalus Quartet unleashed a world premiere performance of Joan Tower’s string quartet, “White Water.” I use the word “unleashed,” because what we heard was a bold dramatic work full of suppressed violence straining to burst its bounds. This work alternates between many emotions, some of which are enigmatic, dazzling, disturbing, serene, and virtuosic to the extreme, but also totally absorbing. “White Water” grabs you by the throat and commands your attention for approximately twenty minutes, and seemingly only a brief twenty minutes at that. The first impression given by this work is how beautifully effective it sounds. To what degree this was determined by Tower’s skill in writing for string instruments or the fabulous playing of the members of the Daedalus Quartet, was difficult to say. The work itself and the performers seemed to be totally together as one. The evening’s concert began with a spirited performance of Haydn’s String Quartet in E-flat Major, Op. 33, No. 2, “The Joke” that contained lovely bits of whimsy in the trio section in the Scherzo, a lovely slow movement and a delicious romp to the end in the finale. Ending the concert we heard Dvorak’s String Quartet No. 14 in A-flat Major, which was a smorgasbord of musical delights. What better way to end a string quartet concert!